This is part 4 of 4 of the Personal Information Security Redux. You can install all the applications featured without user intervention. No “extras” are added on, just the software you request, no toolbars or extra goodies. You can run the installer later to update the applications. Say you get a new computer and you want to add a few common applications. You go to ninite.com and check the boxes for those apps and it generates a single .exe file that can be used to install or update those apps. Its that simple. A DNS server tells your computer the numerical address of a name. Open DNS uses this to provide an extra layer of protection to you by preventing you from accessing known Malware and phishing sites. It is very easy to take advantage of this service, you don’t even need an account (but having one gives you some cool advantages) you just have to use the OpenDNS servers. Go to their setup page for instructions on how to configure your device(s) to use OpenDNS. Spybot2 is really handy in a few ways. One is the inoculation component, this protects your browser and system from some common Malware and Viruses. It also includes a scanner as well as a real time protection. It is most effective to use when you first get your windows computer or after a fresh installation/restoration of your operating system. Advanced users: Ninite link to Spybot2 Installer. Malwarebytes offers a real time scanner in their premium product, however it can be useful to just run a scan on your computer. Using different scanners (not real time protection!) combined can give you better peace of mind that your system is in good shape. Do not run multiple real-time protection products that do the same thing or it could bog down performance or worse. Advanced users: Ninite link to MalwareBytes Installer. Recently I wrote an article about my personal abandoning of Adobe Reader in favor of Foxit Reader. Adobe Reader is far too common of a target and frequently shows up on security notices. Unfortunately being the biggest player in a space also makes you the biggest target, and that certainly applies to Adobe Reader. You’re probably better off not taking the chance and having to worry about the constant updates and security patches necessary to secure Adobe Reader. Advanced users: Ninite link to Foxit Reader Installer. Two Factor Authentication can help you in the event that somehow a password gets compromised. For example if you use LastPass and someone managed to get their hands on your master password, it would be useless to them if you use Two Factor Authentication with your LastPass account. The moment they tried to access the account they would receive a popup requesting the authenticator code. There is a good tutorial on setting this up over at How To Geek. LastPass is a very useful application. 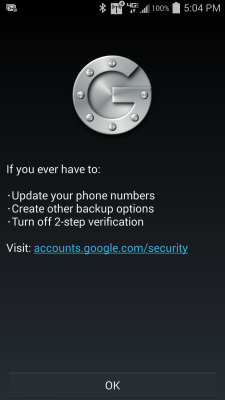 Combined with Google Authenticator you can really improve your password quality. This will reduce the chance of having an account compromised through either a brute force (repetitive attempts to crack it) or dictionary (guesses based on common password combinations) attacks as each and every site you access has a unique and strong password. The “keys to the kingdom” is your master password, so take time to invest in making this both secure but also memorable. Remember that personal information security is about you. It’s about your web habits, what websites you use, how you setup your computer, and your commitment to understanding the threats that are out their. Don’t be lulled into a false sense of security by sales pitches for security products or by that free antivirus software your internet provider gave you. You are in control and you are responsible. Hopefully this series of articles has given you a boost in the right direction. Your comments and feedback are always welcome. This is part 3 of 4 of the Personal Information Security Redux. Since there are things that we cannot protect ourselves from online, the next best solution is to prevent them from harming your computer. This can be accomplished on Windows Platforms by using security software called Sandboxie. What Sandboxie does is creates a virtual sandbox for your browser and other applications to use that does not affect the rest of your operating system. It accomplishes this by storing all the changes that would have been to your system registry and file system into a virtual space on your hard disk. This virtual space is controlled by the Sandboxie application and it can be reset at any time, we’ll get into that more later. 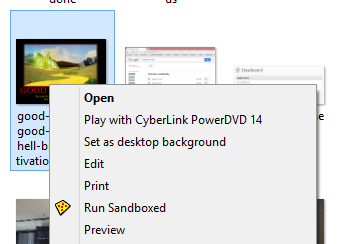 There are only really a few options for Sandboxie. The big one is whether you are using for home or business use. If you are using it for home, you have the option to use the shareware version. The free version has a reminder every time it starts up for a few seconds and does not allow forced programs or folders. The average home user will probably not take advantage of the advanced features, however I would still recommend licensing the product because it is inexpensive and it will allow the developer to continue to improve it. Commercial users must always pay for the product in the form of an annual subscription. The product is very simple to install, just follow the prompts. There is nothing that requires configuration. Had this program been malware, a virus or some other undesirable application that would damage your computer, the sandbox would protect you. The “damage” would be done to the files in the virtual space that Sandboxie is running. 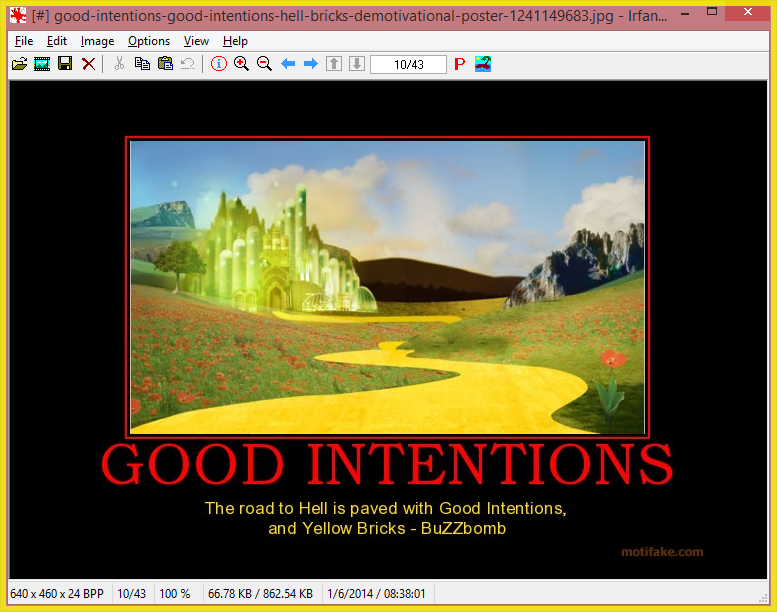 You will know again by the yellow border around the browser, just like the earlier example. While in this mode you can enjoy a layer of protection for your operating system. Nothing that you can access should be able to hurt you unless it is information you input (type) or files that you download and “recover locally”. We’ll address those exceptions more carefully in the next section. Sandboxie will isolate your computer from Malware, Viruses or other things with a few very critical exceptions. Keep in mind that anything you type including passwords, etc, may be captured by malware or key loggers that are able to infect the environment. To avoid this it is critical that you purge the contents of your sandbox periodically, particularly if something suspicious has been accessed. This can be done several ways, but the easiest is through the start menu/programs/Sandboxie/Sandboxie Control. It is also important to keep in mind that besides programs that could be running inside the Sandbox, other information and cookies may be present. So even if you think everything is fine, you still may wish to run the Sandboxed browser in Incognito/InPrivate mode to avoid allowing access to any cookies or sessions that may be running in the normal Sandboxed browser. Think of the advertisements you see on Facebook two minutes after you were on an E-Commerce website. Incognito/InPrivate mode will protect you from that kind of targeting. 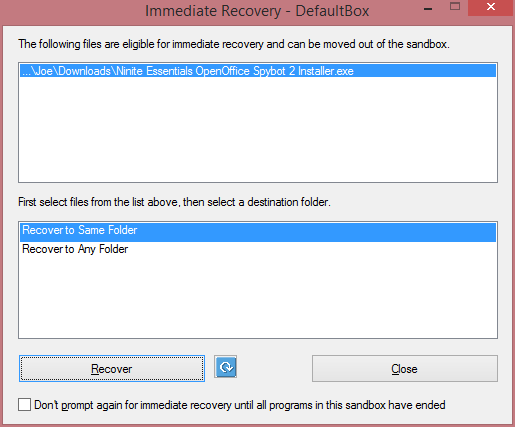 Choose “Close” to avoid the file leaving the Sandbox. There are some useful tips in this article, if you are unsure of something don’t take risks with your personal information security. Do some research and educate yourself before making a mistake. Back in October 2010 I wrote an article about personal choices being the most powerful information security tool. It is now January 2015 and while other things have changed, this simple fact has not. You are still the most critical piece in both your personal and work information security apparatus. In light of all the recent developments including the very high profile hacking of Sony Pictures Entertainment and while preparing for an upcoming speaking engagement, I decided it was time to refresh some of the content here on my blog. This is obviously article #1 of this series, what will be addressed in 2-4 and why? Where we are most vulnerable online. A powerful tool to keep you safe online. Other valuable tools for Personal Information Security. In this section the specific applications and services that are most likely to lead to a compromise of your information security are to occur. This will enable you to be particularly cautious and invest time where it is most likely to spare you the inconvenience and expense of being compromised. What tools are available to protect you online? With knowledge of where you are most vulnerable, we’ll address one particular tool that will help protect you. It is unlikely that you’ve heard of this tool, but you will find that it is a powerful asset to keep you safe. Some extra tools are covered that will help make your online experience more secure. 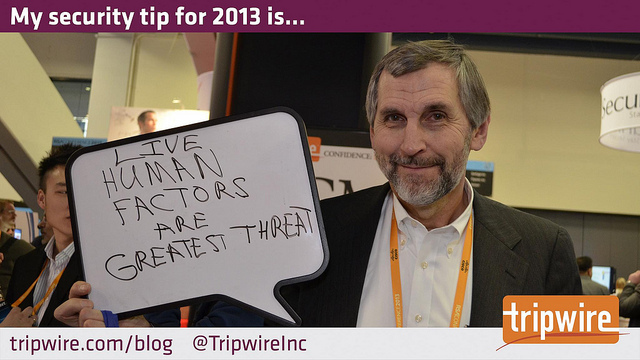 Image Credit TripwireInc, Creative Commons. Recently while discussing an ordeal one of my customers went through due to a bad hire, we started discussing a different criteria that makes a big difference with hiring. The benefit of experience is seeing patterns and applying them to other related things. A bad hire can have grave consequences for even the most healthy companies. For this article we’ll focus on the information security criteria of new hires. For starters I’ll share some of the good and bad patterns, then we can address together the value of applying this to your hiring practices. If you are not involved with hiring you might want to apply the information to help you understand your strengths or build up areas of improvement. One factor I’m going to leave out of this is the InfoSec infrastructure and culture of your company. If it wasn’t good you wouldn’t be able to tell if you were hiring the right people or not, everyone would have problems. Your websites would be getting hacked, your Email accounts would be getting shut down because they were sending spam and an abundance of other similar issues would exist across the board. How do you know you have employees that should be ranked as good in terms of information security? The biggest factor is, do you ever have any problems with their computers and accounts due to some compromise? Good InfoSec hires will rarely if ever open suspicious Emails. They will rarely if ever click links they shouldn’t have. They will rarely if ever have to talk to IT or have a system restored due to a security issue or compromised account. What characteristics do good InfoSec hires demonstrate? Responsibility – individuals that exhibit responsibility will be less likely to make careless mistakes that compromise your security. Street Smarts – being able to spot a con is actually a very valuable trait. A little street smarts goes a long way, candidates that are too innocent and lack worldly experience are much more likely to become victims of phishing attempts. Generosity – Greed is one of the predominant traits that criminals play on, an person who is fiscally generous is much less likely to fall into these traps, or others, that could have a huge fiscal and reputation impact on your company. Digital Native – candidates who have a strong mastery of software, social networks, computers and smart devices are much more likely to understand the ever present risks and instinctively make good decisions. These are just a few traits, it is likely that others are also valuable, if you have suggestions to add use either the comment or contact me to share. Carelessness – candidates who are careless will struggle with issues like identity theft, become victims of scams and face infiltration from Malware and viruses. Innocence – adults in the work force will need some basic protections, candidates that are too innocent are an easy mark for some kinds of exploitation. Greed – people who might be willing to compromise values or fall for scams due to greed are not good hires. Greed also tends to replicate entitlement, and greedy people will think things are owed to them and be less likely to produce quality work. Technology Challenged – lacking experience with technology means that certain things will be learned the hard way. Suggestions are welcome, and I think there is a great opportunity for a lively discussion about this in the comments or privately via Email. Ask candidates if the last time they had a problem with a computer or smart phone. What was it related to? What did they do to fix it/get it resolved? You can follow up with more specific questions about viruses, malware, etc. Call both references provided and seek out others that they did not mention, but may be listed in their LinkedIn or other profiles. One technique that might be helpful is to check for people you have in common at those companies, they will be more likely to introduce you to the manager they worked with. This could be a great option to determine the character qualities of your candidates. Present a scenario that the candidate is unlikely to have knowledge, see if they are able to deliver a potential solution using gut instinct. This will help determine their street smarts. If they have stated software or technology skills that you are very familiar with, talk about those things to gauge how well they really know them. These are some examples but I’m willing to bet you can use the concepts and come up with even better options that fit your company and candidates better, after all you know your business better than anyone else. 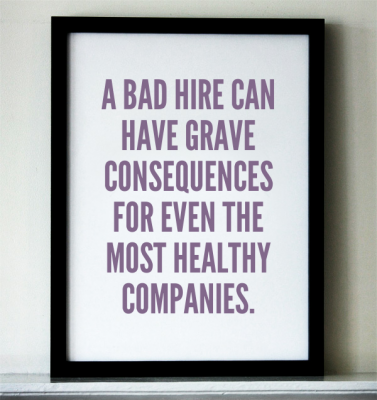 The main intention of this article was to help you avoid a bad hire that could hurt your company. Most of the people I work with aren’t huge companies and cannot afford to make poor hiring decisions… do you have any tips to share that might help others?